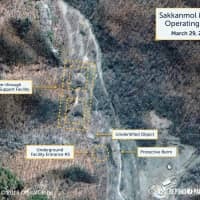 A U.S. think tank says it has uncovered 13 of an estimated 20 North Korean missile operating bases inside the country — including those believed to house ballistic missiles capable of striking anywhere in Japan and the U.S. — highlighting the difficult road ahead for ridding Pyongyang of its nuclear and missile arsenals. 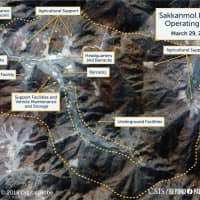 The report, released Monday by the Washington-based Center for Strategic and International Studies, said maintenance and minor infrastructure improvements have been observed at some of the sites, despite ongoing negotiations with the United States over the country’s denuclearization. 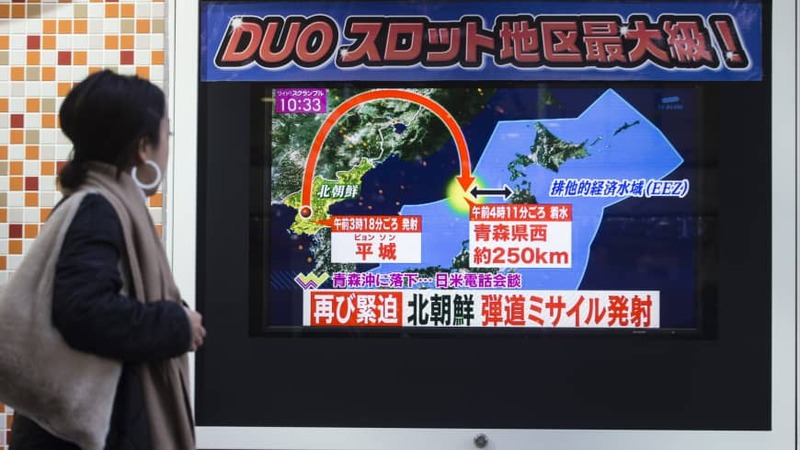 The missiles housed at the sites are likely to include medium-range Scud-ERs and Rodongs, which test-firings have shown are capable of striking key targets in Japan. 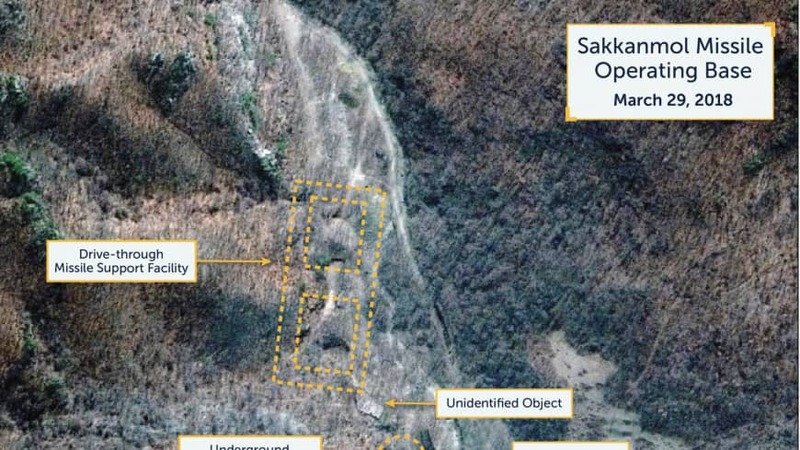 At least one of the bases uncovered is also believed capable of housing newer, longer-range weapons such as the Hwasong-14 intercontinental ballistic missile, which was tested last year. The report, however, noted that the missile operating bases “are not launch facilities” themselves. “While missiles could be launched from within them in an emergency, Korean People’s Army (KPA) operational procedures call for missile launchers to disperse from the bases to pre-surveyed or semi-prepared launch sites for operations,” the report said. 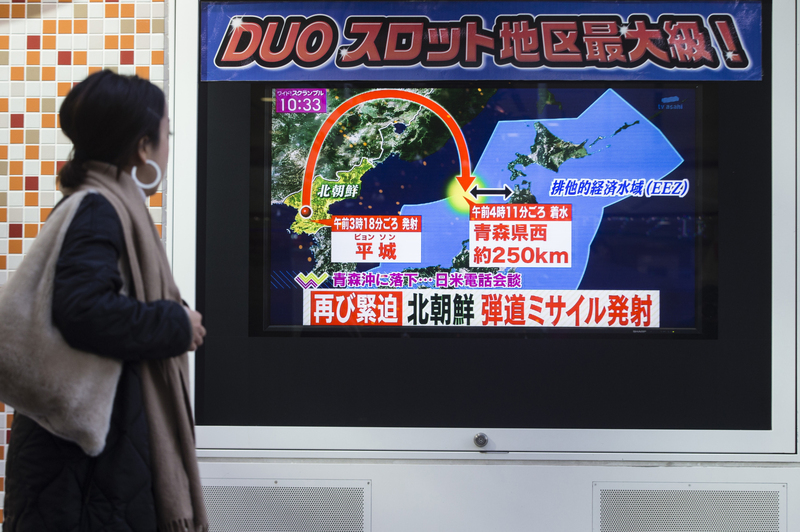 None of the sites have been acknowledged by Pyongyang, though observers say a disclosure of both the size of the country’s nuclear arsenal and its missile capabilities would be a key ingredient in any denuclearization deal. The North has reportedly said that revealing such information would be tantamount to submitting a list of targets the U.S. could attack. 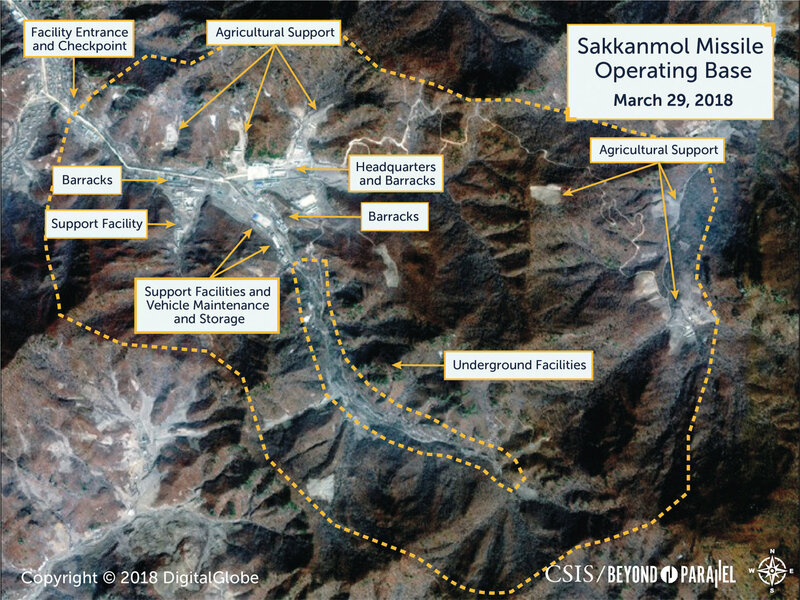 Kim specifically took aim at suggestions that the bases represented a “deception” campaign by Pyongyang, or that there was any agreement that required the North to declare the existence of the bases. At a landmark June summit in Singapore, North Korean leader Kim Jong Un agreed to a 1½-page joint statement to “work towards the complete denuclearization of the Korean Peninsula,” while U.S. President Donald Trump committed to “provide security guarantees” to the regime. But the vaguely worded deal reached in Singapore — and the resulting stalled denuclearization talks — gave ample ammunition to many critics who pointed to North Korea’s long history of obfuscation and outright double-dealing on past agreements. 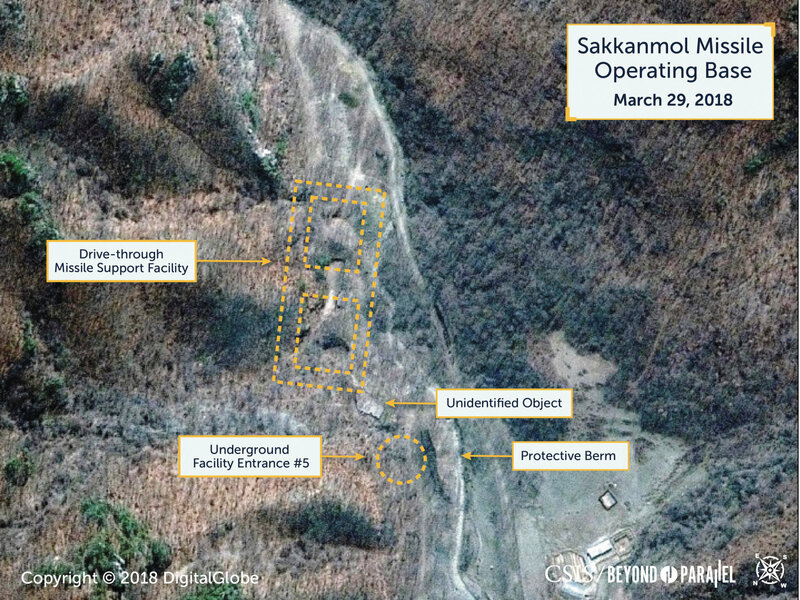 Monday’s report of ongoing activity at the missile sites, while not technically flouting the Singapore agreement, is likely to be seen as a violation of at least the spirit of the deal, especially by Japan, which North Korea last year said it had practiced targeting. 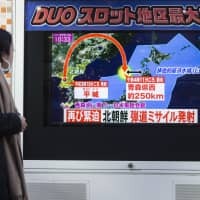 In an unusually overt threat in March 2017, the North said that a test-firing earlier in the month of a barrage of missiles had been training for a strike on U.S. military bases in the country — a type of saturation attack that experts say could leave Japan vulnerable. 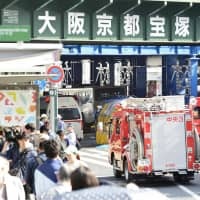 Prime Minister Shinzo Abe, long wary of such a possibility, has steadfastly maintained that the North’s huge arsenal of shorter-range missiles capable of striking large chunks of the Japanese archipelago be part of any denuclearization deal. But while the Trump administration has provided lip service suggesting that these missiles will be part of its denuclearization push, few concrete concessions over the North’s missile arsenal have emerged in Washington’s dealings with Pyongyang. “I’ve come to see Japan’s push for shorter-range missiles as part of the U.S.-North Korea negotiations more as a marker laid down for addressing in the future rather than an expectation that the U.S. would push for — and North Korea would accept — verifiable reductions as part of an initial agreement,” said James Schoff, a former senior Pentagon East Asia specialist now with the Carnegie Endowment for International Peace in Washington. 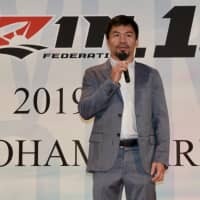 Schoff said Japan is correct to believe that any demands added later on will be seen by the North Koreans as “moving the goal posts” and undermining current diplomacy. In January, Kim declared his country had “perfected” its nuclear forces and later in the year announced that it was halting longer-range missile and nuclear testing, setting the stage for the June talks. But in the more than five months since, negotiators have yet to elicit from Pyongyang a declaration detailing its weapons programs or a promise to rein in the deployment of its existing arsenal. 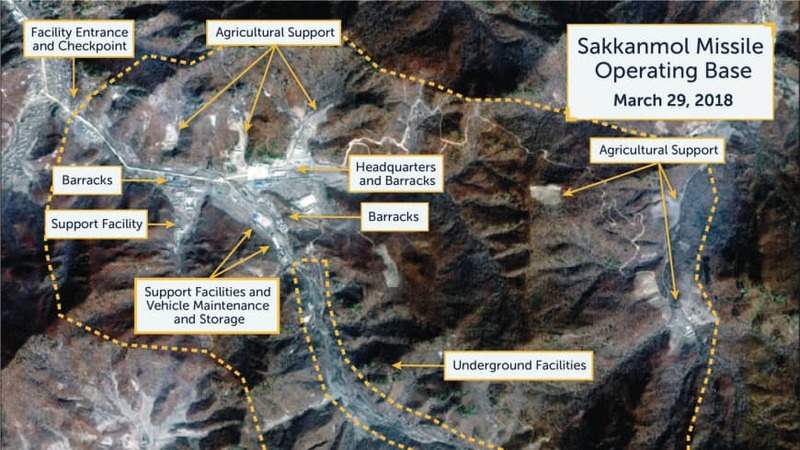 Instead, the North has touted the closure of its main Punggye-ri nuclear test site and the apparent ongoing shuttering of its Sohae missile-engine test facility. It has also dangled the possibility of closing other sites and allowing international inspections — but only if Washington takes “corresponding measures,” namely the relaxing of crushing economic sanctions. These repeated demands of reciprocal moves, however, have been met with the same response by Washington: Pyongyang must first give up its nuclear weapons. This prompted North Korea to warn earlier this month that it could even revive its scrapped policy of pyongjin, or “parallel advance,” in which the country simultaneously pursues economic and nuclear development, if its demands are not met. In April, Kim abruptly announced he was retiring the dual-track policy and adopting a “new strategic line” that focuses on rebuilding the country’s tattered economy. 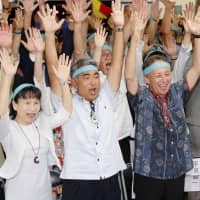 Perhaps more pressing for Washington and Tokyo than a return to this stance, however, have been recent media reports citing anonymous U.S. intelligence officials as saying that work on the North’s nuclear program continues unabated, despite its pledge to take steps in the opposite direction. Indeed, the CSIS report notes that revelations of continued work on the missile sites was not entirely unexpected. “The deployment pattern of the KPA’s ballistic missile operating bases is logical for a nation that still believes it is in a state of war and must be ready to defend itself from outside aggression at any time,” the report said.